As I've said before, in the "Get a Mac" ad campaign, Apple is focused on screw ups with Vista and PCs in general being junk. Apple is going to continue to reap the benefits of this argument until things get better, or at least until the opinion of PCs improves. Steve Ballmer doesn't get this with his claims about the "Mac Tax". Sure, some PCs are cheap, but that doesn't create value. Even the word "cheap" creates the impression of shoddy or inferior to save on cost. The Mac Tax argument does nothing to improve the public's opinion of Vista or PCs. If I was HP, I'd be ticked that Microsoft used my product in its campaign to promote the low cost of Windows notebooks. HP, like everyone else, wants to sell its most expensive models. Microsoft did nothing to promote the sale of expensive PCs. Instead, we buy their product when we are broke and need a handout - or "aren't cool enough to own a Mac". The whole low-cost argument also works in favor of Linux over Windows. Why buy a Windows machine when you could get a cheaper Linux computer? I guess Ballmer would switch his tune here and claim that value is more important than cost. It may be true, but it isn't good marketing to confuse the customer. 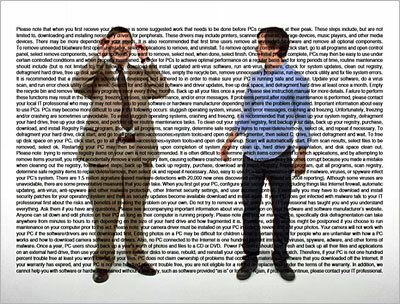 Apple's latest ads, such as "Legal Copy", show how ready it was for more attacks by Microsoft. It didn't even have to change its approach to respond to Microsoft. Nothing has changed with PCs. Worse, Apple claims that for PCs will still crash years to come. Microsoft, please let Windows 7 be good enough, or we will be stuck with "Get a Mac" ads for the next 141 years.